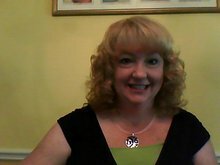 I am a Southern fiction writer from just outside Atlanta. My work has appeared in Bellevue Literary Review, Natural Bridge, and Apalachee Review, among other publications. I'm a Sewanee Writers' Conference alum ('08) and I'm seeking representation for my novel manuscript. And oh yeah, while I'm bragging on my great accomplishments, I've got a real live, bonafide HIGH SCHOOL DIPLOMA....(wait for it....) FROM GEORGIA!!! Yeah, woo hoo! No letters after my name, but I'm doing okay. LSD and Golden Grain. No, not really. What really fuels my creativity? Depression. Anxiety. Sexuality. Why do I write? I dunno, I feel like it, I guess. Plus I know I'm good at it so there's always the crazy dream of someday getting paid and quitting my real job. Silas House, and my favorite book of his is Clay's Quilt. Sheri Reynolds-- The Rapture of Canaan. Enjoyed your blog, too, Kim. Welcome to FN! Thank you. Gee, I haven't updated it in 100 years, I can't even remember what's up there. Better go look. Your blog is a lot of fun. Welcome. You must log in to write on Kim Foster's wall.